Everyone who’s had an interest in Japanese food in Singapore would have heard of Aoki Restaurant, opened in 2003 by Kunio Aoki. 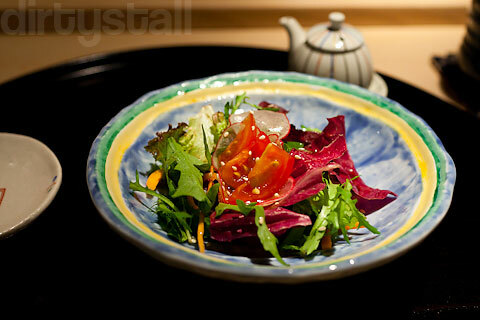 The restaurant has a nice and warm feel to it, mainly due to the good use of wood and rice paper as decor. A lot of people have heard about Aoki’s famous maze-chirashi lunch set, and after years of hearing about it, I finally decided to go for it. It is very popular and I’m told they only make a limited number of sets (~10) so make reservations if you want to try it! 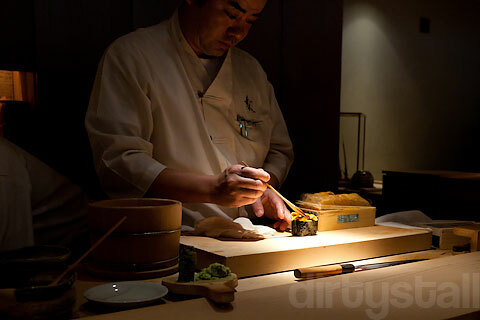 Here is chef Aoki in action, making an uni gunkan-maki. 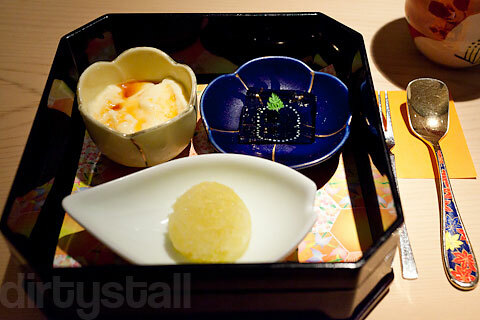 The set begins with an otoshi of braised renkon – sweet and crunchy. Next was a salad. I can’t remember exactly what was in it but there looks to be cherry tomatoes and mizuna in it. Overall quite delicious! 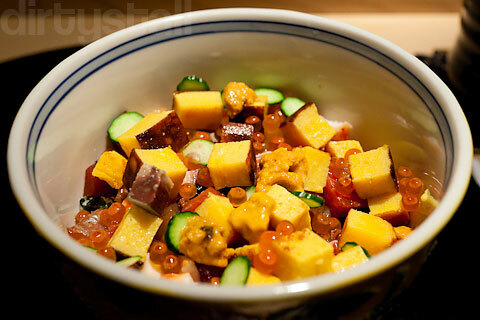 And the main dish itself – the maze-chirashi. Generous amounts of cubed fresh and premium seafood such as toro, hamachi, saba, kanpachi, ebi, etc are layered on top of the deliciously seasoned sushi rice, and then topped with small dollops of uni, castella tamago cubes, ikura, slices of Japanese cucumber and shiitake mushroom, strips of kanpyo and nori. There’s more of course but I can’t remember everything and it also depends on what’s fresh that day so the toppings will vary on different days. Tsukemono, served beside the maze-chirashi. Sour and crunchy, but just nice on the pickling unlike other places which can get too sour. 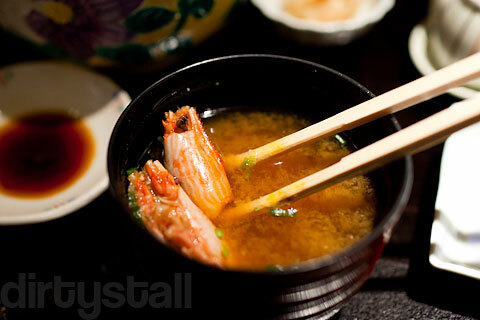 Their miso soup is simmered with the prawn heads, imbuing the soup with a taste of umami. Dessert is a bit of a surprise as I was just expecting a bowl of ice-cream, as is the norm for a lot of Japanese restaurants here. 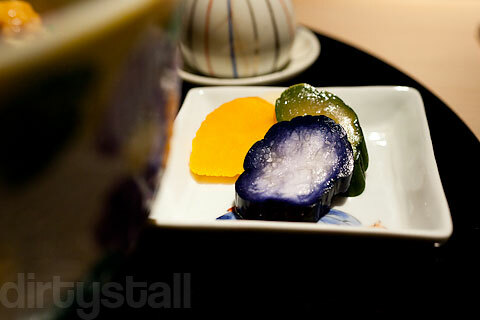 But instead we got 3 different types – milk custard pudding, umeshu jelly and a musk melon sherbet. All were very good! All in all this was an excellent lunch, made even better when dining with good company! OMG this is like one year overdue hahaha. Aoki doesn’t serve mekajiki. 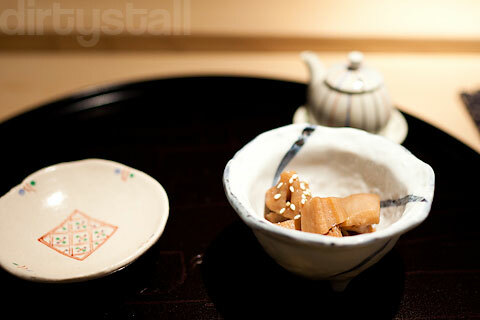 If you notice, in Japan they don’t serve mekajiki as sashimi because swordfish is not meant for sashimi. Swordfish in Singapore are imported frozen. High end Japanese restaurants here like Tatsuya, Shinji, Nogawa, Aoki do not serve swordfish at all. At most seared, like in Tatsuya. Ah ok have to blame my memory then hahaha! Damn good bowl of chirashi, really want to go back there again as i was typing out this post and looking at the photos again lol. i’m guilty of having a long backlog too 😡 i think i’ll finally be free to meet up after this week haha! About time. Lol. Just when I was thinking of Aoki and a possible omakase. wow. a feast for the eyes! I read that Aoki is one of the restaurants offering Hida beef as part of the Feel Gifu campaign.